Brand new to Lilykiss, printing in wood is our latest beautiful product we are so pleased to bring you! 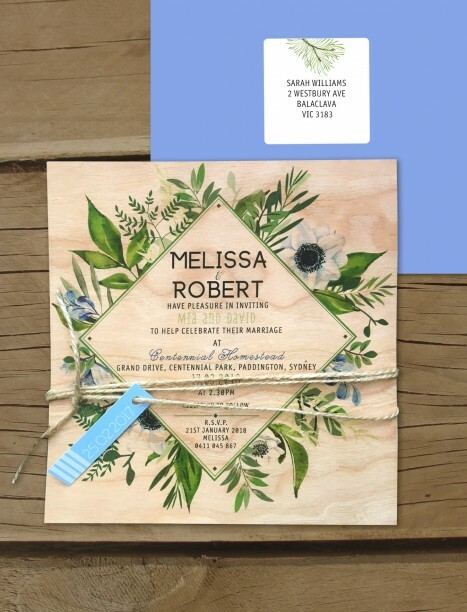 These rustic Evergreen foliage wedding invitations have a unique factor unlike any others - as far as getting 'wow' comments, paper will find it hard to compete with the qualities of this thick, yet elegant wooden technique. These invites are so different, the effect of the gorgeous grains poking through is just divine, we are in love with them! They are truly unique. Seen here in our beautiful tree design, it has such a friendly and romantic feel with it's sprawling leaves. This stylish design is the perfect combo of country rustic and chic. Such a striking invitation. And.... the best news is that this wedding invitation is so eco-friendly! We are so happy to tell you that the amazing printers we use for these guys are truly one sustainable little set up. They tell us that their timbers are naturally better for the environment than paper. They use less waste, chemicals and emissions - and the best part?! Even though your invitation order will only be using a small fraction of the tree - they replant a full tree for you! Thats a full tree, we think they are amazing and so happy to be working with them. We just love that not only do these invitations look SO, SO amazing and unusual, but by ordering them, you get a tree planted, making this world a little greener than before. There is so much to love about our printed on wood invites. Seen here in birch and cherry wood - the lighter wood suits the pastel better - producing a gorgeous effect with the wood grain poking through the pastels, producing a stunning tonal effect. To feel the grain, and the textures, these wedding invitations need to be held to be fully appreciated just how magical they are. We highly suggest ordering a sample for $5. We can match the envelopes with a matching kraft, earthy brown envelope as well if you prefer. These designs are brand new to lilykiss - so rsvp cards, placecards and wishing wells and all matching items do all exist in this design - please get in touch if you'd like a pic, up online soon! We hope you love these darling tree designs as much as we do :) Claire and The Lilykiss Team x *Please note, the cherry wood is the darker and most grainy - so pretty, but given the nature of the material, being wood! The colour might vary slightly for your actual order from the sample you receive. It will still of course be cherry wood, but we can't guarantee the colour of each tree, they will be similar but some have a little more pink undertones and some a little more yellow - however they are all just divine. Part of the beauty of woking with a natural material. Also note that the wood comes in 2 thicknesses a thicker is available on request. As well we are busily getting up matching rsvp cards, placecards, save the date cards and menus and all other matching stationery items in this wedding invitation design! They look amazing as a set please ask us for images if you are interested as we just haven't had time to get them up as yet! Soon!